Your feet are the foundation for your body. They help protect your spine, bones, and soft tissues from damaging stress as you move around. Your feet perform better when all their muscles, arches, and bones are in their ideal stable positions. By stabilizing and balancing your feet, Foot Levelers orthotics enhance your body's performance and efficiency, reduce pain, and contribute to your total body wellness. Orthotics complement your healthcare professional's treatment when you stand, walk, and live your active life. 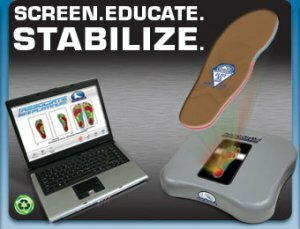 At Tinkle Chiropractic, we use cutting edge technology via Foot Levelers V7 scanners to evaluate your feet and determine if they are a potential cause for your foot, knee, hip, low back or other pain. Your body will never be properly balanced if you don't identify the CAUSES of your imbalance.